As a book blogger I get invited to a lot of bookish events, most of which I can't attend due to various reasons. This morning I was invited to The Mortal Instruments: City of Heavenly Fire launch party which is in London on May 27th. I am such a huge fan of the series so I was extremely disappointed about not being able to accept the tickets (and I really wanted an early copy of CoHF...) So I'm giving one of you the chance to win a pair of tickets to the event! While there, you would be on a not-so-secret mission: to report from the event by taking photographs and making notes, like I did in my event report from the Divergent movie premiere. Your efforts wouldn't be for nothing! In exchange for me giving you the tickets, you would also get your event report up on The Mile Long Bookshelf where your writing and your photographs would receive a wide and excitable audience. You can see an example of what would be expected of your event report here. Tickets have already sold out for this event so if you didn't manage to get any when they were on sale, you don't need to worry because now you have the chance to win a pair - for free! - Competition will run on 'The Mile Long Bookshelf' website. - Competition will run from 01:00am on 17/05/14 to 00:00 on 20/5/14. - Entrants must be over the age of 13. - Competition is open to UK residents only. - Winners will be notified via email. Failure to respond to notification of winning the prize by 2pm on 21/05/14 forfeits the prize and the promoter will have the option to randomly pick another winner from the pool of entrants. - The promoter will pick 1 winner based on whose entry sounds like they will do the best job. 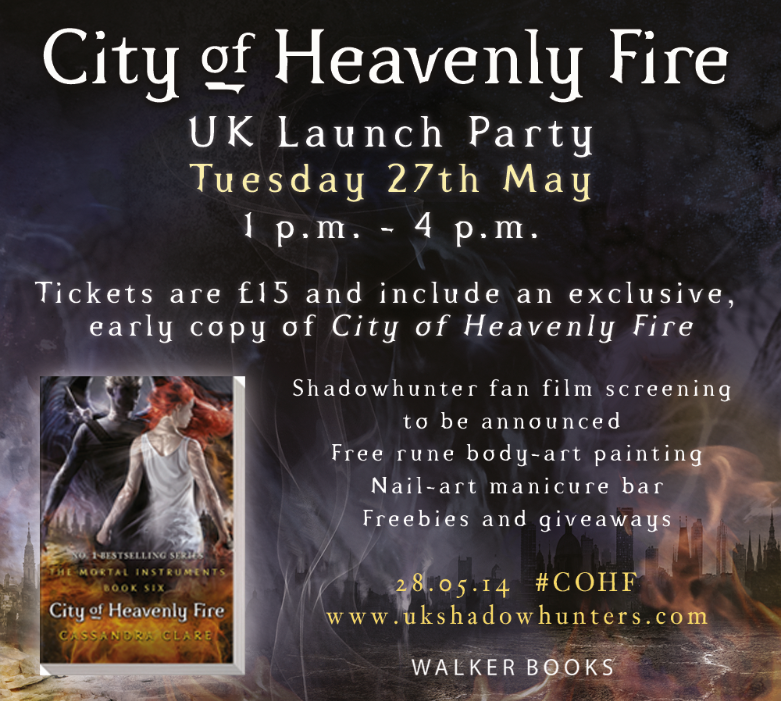 - Prize for 1 winner will be 2x tickets to the City of Heavenly Fire launch party on 27/05/14 and a dedicated spot in 'The Mile Long Bookshelf' post schedule for the winner's event report. - There is no cash alternative and the prize is non-transferable and non-refundable. - If winner is under 16 then the guest must be his/her parent or guardian, whom is over 18. Time and Date: Tuesday 27th May at 1pm – 4pm. Venue: Somewhere in London. Details regarding the venue will be emailed to the winner. What will happen: You will receive an exclusive, early copy of City of Heavenly Fire upon arrival. Join us at this special Shadowhunter Super Fan event and be one of the first people in the country to get your hands on a copy of City of Heavenly Fire, a day earlier than books will be available in the shops or for online retailers. Your copy will include a comic strip episode exclusive to Walker Books editions, and a full-colour fold out poster with new character art. Thank You SO SO SO much for this amazing opportunity!!! ERMAHGERD! I would die for these tickets!! This is the most amazing competition in the history of competitions. Like ever. This amazing I was heartbroken when I found out the tickets were sold out!